A vegan diet eschews all animal products, including dairy and eggs, and relies on plant foods for nourishment. While it is possible to get all the nutrients you need by eating a plant-only diet, it takes careful planning. In some cases, a lack of proper nutrition can lead to excessive hair loss. It's completely normal to lose 100 to 200 hairs per day, but if you find you're losing a lot more, consult a health care provider to make sure you don't have an underlying health problem. You should also examine your diet to ensure you're getting enough calories, vitamins, minerals and protein to keep your hair at its healthiest. Zinc tends to be underconsumed on a vegan diet, according to "Proceedings of the Nutrition Society," and a zinc deficiency could cause hair loss, as well as unruly and dull strands. You need 11 milligrams per day if you are an adult man and 8 milligrams per day if you are an adult women. Some of the most abundant source of zinc are oysters, beef, pork and chicken -- foods not included on a vegan diet. You can increase your vegan intake by consuming more beans, wheat bran, seeds and nuts as well as fortified cereals and grains. Consult your doctor before adding a supplement. Vitamin B-12 is only available in meats, fish, poultry and other foods that come from animals, as well as in fortified cereals and grains. Vegans risk not getting enough of this essential nutrient that, when consumed in inadequate amounts, can lead to a scaly scalp and hair loss. Tempeh and nutritional yeast are vegan sources, but it can be hard to get enough of this essential vitamin through these sources alone. Talk to your doctor about taking a B-12 supplement if you're committed long term to your vegan diet. Your vegan diet may seem to include plenty of iron from green vegetables, lentils and fortified foods. The iron in plant foods, though, is less available for use by your body than iron derived from animal sources. Iron deficiencies may thus develop while following a vegan diet. Iron deficiency can result in hair loss as well as fatigue and weakness. The recommended daily allowance for iron is 8 milligrams for adult men and 18 milligrams for adult women. If you're vegan, you need 1.8 times this amount, explains the National Institutes of Health, because of the lower bioavailability of plant-based, or non-heme, iron sources. Consuming vitamin C around the time of your iron-rich meals enhances absorption. Low-protein consumption and rapid weight loss associated with a vegan diet could lead to hair loss. You can eat protein in abundance on a vegan diet, as long as you include nuts, seeds, legumes, beans and soy. Relying too much on soy products could be problematic for your hair. Soy can aggravate hypothyroidism in those predisposed to this condition or those with low iodine intake. A symptom of hypothyroidism is excessive hair loss. Consult with your doctor if you feel hypothyroidism may be an issue and vary your protein intake. A deficiency in the amino acid L-lysine can also lead to hair loss. L-lysine is readily available in animal products, but the primary plant-based source is legumes. If your vegan diet doesn't include a lot of legumes, you may find yourself deficient. Columbia Health: Vegetarian — Hair Loss? What Will Happen if I Only Eat Fruits & Vegetables for 2 Weeks? 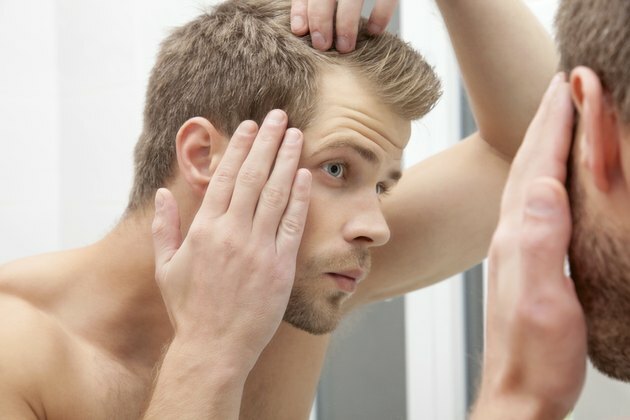 Can Vitamin B-5 Help With Hair Loss?